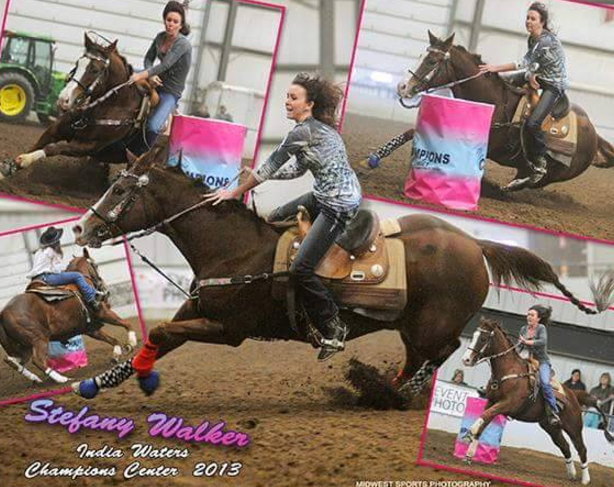 Here is a little more about Stefany and India Waters who will be running at the BOTB in August. Where did you and India Waters qualify? We qualified at Diamond 7 Arena in Dillsburg, PA.
Tell us a little about your horse: India Waters, “sissy” is a 12 yr old granddaughter by first down dash. I bought her as a 4 yr old from Craig Brooks. She has a gritty attitude, alot of try in the barrel pen, and the most athletic horse I’ve sat on, but she is the biggest drama queen around and if anything goes wrong her entire day is ruined! She loves to control everything and would rather hangout with people than horses. Everyone has a favorite place to run, tell us what yours is: I would have to say Diamond 7 Arena in Dillsburg, PA, I have had alot of success in that pen and just love the setup and ground. Each year we all love to attend a favorite show, what is yours? I love attending the BOTB! I have ran the past several years and love how much effort they put into making the slot race a big deal and how much fun it is running in the slot race!! Give us a little more insight about you and your horse: I’m very blessed to have family who supports me and great horses to haul down the road with. Previous Cheryl Lennemann and Drei from Petoskey, MI are back in Springfield doe the BOTB! Next Savannah Scales from Kalkaska, Mi qualify for the BOTB!